They accepted our offer! Chris and I were both somewhat shocked as we thought there would be a bit of back and forth… but God provided bigger and better than we expected! We were able to get our little house for almost $25,000 less than asking price! Isn’t it charming? I really am so excited, it’s a bit smaller than our house now, but I really think it’s going to be perfect for us. And with the $ we didn’t have to spend on the house, I’m going to tackle a mini re-do on the outdated kitchen. But our new house is a solid little thing, well built and on almost 2 acres of land, right across the street from a pond! And the current owners have just loved the heck out of this house. It just feels good inside… like you expect to smell bacon and pancakes cooking on the stove and see smoke billowing out of the chimney. We hope to close on it by the 15th of July. In the meantime, between our closing on this house on the 27th and our new house on the 15th, we’ll be homeless… an adventure will be had to be sure. 2 adults. 8 kids. 2 dogs. And a whole lotta stuff. Should be interesting. OH STEPH! It is a HAPPY HOUSE!! You guys are going to love it there. Congratulations! It is a very charming and lovely home, and two acres! Wow! I look forward to the many wonderful posts to come from this place. Congratulations on your new home! It looks so inviting! Just add kids! Oh I just LOVE it!! Congratulations! As a woman I'm supposed to say it looks beautiful which it does, but my kid in me think that place looks really fun too! Your housing updates are welcome since I don't have access to my favorite home and garden shows anymore. LOVE the house! perfect! We love our 2 acres. WEll maybe not right now when it is over 100 degrees, but usually! I look forward to hearing all about the crazy moving details! Praying! p.s. my word verification is "blessi" I guess short for blessing? Perfect for your post today!! Congrats!!! Love the house! You can tell she's got lots of character!!! Can't wait to see before and after photos! Love the new house!! Congratulations!! praise GOd! that is one CUUUUUTE house! i am so excited for you and this great adventure you are on! can't wait to hear and see more! Yay! I love that house. Looks like there is plenty of room to play. Get it all fixed up before the Army moves you again. I think next time we move, I am going to pack in tupperware instead of suitcases. What an adorable home! It looks so sweet. Sounds like you will be so very busy the next several weeks, at least you might get your mind off the wait for little Viv for a bit! WHat a lovely house and 2 acres?!?! Wow, nice. Charming and TWO ACRES!!!!!! I would say it is PERFECT! I am so happy for you! What a blessing! You are so right! God is the best house hunter, realtor, and closer on the planet! I wish you a multitude of blessings on this next adventure! What a great house! 2 acres sounds great for 9 kids and 2 dogs! Congratulations!! So where in the Northeast are you moving? Are you coming to New England? We live in MA on the NH border. This house definitely looks like it would fit right in in NE!! If so, welcome to our neck of the woods! Mazel Tov and congrats. So where in the NE are you headed? Wow! "Charming" is in understatement! It's gorgeous!! Looks like there's plenty of room for company too (hint hint). Wow, what a beautiful home. With a large family, I have decided that the outside space is just as important, if not more, than the inside. Oh how I wish we had 2 acres. In our next house…. :-) Anyway, Congratulations! I'm intrigued, can you give us an idea of where in the northeast you're moving? The DC area maybe? It looks like a DREAM!!!! Sooooo glad it all worked out!! Wow…2 acres! This NY'er can't even imagine that amount of space!! lol!! Sounds PERFECT for you all!! WooHooo! Congratulations. It's a beautiful and very charming home. I'm so happy for you that it all worked out. Can't wait to hear more about the big move! Maybe I can come up and strip some wallpaper with you! To Colleen who posted…I'm in MA near the NH border, too. What town are you in??? Oh, Yeah! It is beautiful!! It IS a great market to buy!! We just bought too – no counter offer, for $45,000 less than original asking price!! Woo-Hoo!! We left Colorado on the 29th of May, supposed to close on the 9th of June. What is it? Almost the 18th? We are living it up at the Comfort Suites! We are only 2 adults. 3 kids. 1 dog. I need to up my prayer life, I am sure. However, I have learned that I actually CAN swim. Huh. Maybe it WAS always the SUIT I was afraid of? GOOD LUCK!!! It is truly an adventure and God is SO MUCH bigger than all the crap! Congrats! What a cute house. I love it! However, I wouldn't call it small, it looks quite large in the picture. Do you mind sharing what state you are moving to??? Congrats on your new digs!!!! It looks like a very charming house, and I know it won't be long before you put your beautiful decorative touch on it. Can't wait to see the after pictures (Chris emailed us today, so we've seen the before). And I know it's the opposite direction, but y'all are always welcome in Texas – all of you. CHARMING is EXACTLY what came to my mind the moment I seen the photo… I LOVE IT!! It looks so peaceful and serene… a PERFECT family home! I can already imagine a lot of Bakerella recipes baking in the oven and filling the air with yummy aromas! Congratulations! God is SO GOOD!!! Love the house – congrats! The kids will love the 2 acres and I see lots of exploring over at the pond. One year when the military moved our family, we went from June to Aug without a house. My parents were big campers though, so we just parked our camper at (the new location) local RV park & stayed there until they found & closed on a house. The Comfort Suites (or Inn) also has longer stay rates available & little kitchenettes. You might also find a vacation rental in the general area that would be furnished & more homey feeling. Many of those allow animals. Good luck. I'm sure that part could be stressful until you figure it out. Awesome!!! I absolutely love the house!!! Beautiful house! Lovely piece of property too! It looks so charming and homey! Can't wait to see more pictures!! oh it looks perfect! and two acres sounds like such a dream. best of luck during the move and homeless phase. I love the house! I live in CT, so it looks like what I would like. And 2 acres? That's wonderful! Enjoy it! You said it perfect. Charming. I love it! I am so glad they accepted your offer. Congrats to you and your family! That house SCREAMS New England charm- maybe why I love it!!! 2 acres??? That's fantastic. Congratulations! Praying your move goes well!!! Hope you ended up loving the north! It will be a place of many happy memories!! Can you email me personally? I think we may have gone through the same agency! Congrats!! Now you can relax … and then pack, pack, pack! 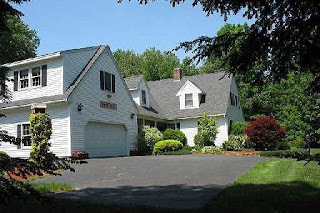 The house is so, so cute and charming, a perfect family home… very, very New England, too! And having 2 acres is awesome. Your kids will love to explore that! As for the wallpaper (I have had to take down way more than my share, thankyouverymuch! ), I have found that a vinegar & water mix works just as well as Diff, and costs alot less, with less residue, too! Congrats again! So happy for you! Congratulations!!! It is a lovely, wonderful, home-y home! What a darling house 🙂 We are moving in the next year and you give me hope of finding a house that is just right for our family! Where in the NorthEast? Us New Englanders want to know! It's beautiful! I love it!! It s so charming!! I am excited to see the before and after picks as you make this "your" home!! I love it love it love it! It looks like it will fit your family perfectly and plenty of room for running around outside! All those youngins will be fishin' the days away at the pond! FUN! Praying for a smooth transition! Congratulations on the beautiful new house, about to become a home, your beautiful home! While you're moving in, we'll be in China bringing our son home, finally! Congrats! It looks like a beautiful house! Congratulations. Can I come help you move? That driveway is meant for kids! Your new home is adorable. Congrats! It just oothes HOME!! Love it. It feels like my folks home in Indiana. Say a prayer for us. We had our first ever home study today.It was the first of 4 visits. we're just rookies compared to you guys. Becuase of No Hands But Ours, we prayed for God to open our hearts to SN. we have a long road to travel, but in God's time, not ours. Love the house! I am in the same boat if the offer I have in is not accepted soon we too will be homeless. Happy packing I don't know where to start. Any suggestions? Gorgeous new home!! It looks so cozy, warm, inviting and so perfect for raising a family. Hooray! Can't wait to hear and see more about it. Yippee yai ai caiee….sounds FANTABULOUS! Sure does look like the North East if ever I saw it…..
are you ever going to tell us which State? You'd be great if you were ever in the witness protection program, you mysterious woman, you! I too purchased a house from older folks and was confronted with wallpaper in every room. Can we say 4 different floral papers in varying depths of country blue just in the master bedroom?! Soon you will be chanting my mantra: "A pox on the entire wallpaper industry and to those poor souls who've been sucked into the trap!" Its Beautiful! Looks Huge to me and two acres! WOW! Yippee Yahoo! Oh yes, that home says, come on in, have a glass of lemonade and sit a spell! I LOVE IT!!! Okay, so I gotta ask…how far northeast are we talkin' here??? You have been so heavy on my heart everytime I pray…guess this was it! Moving! Praying for you over the next few weeks as you do the adventure thing!